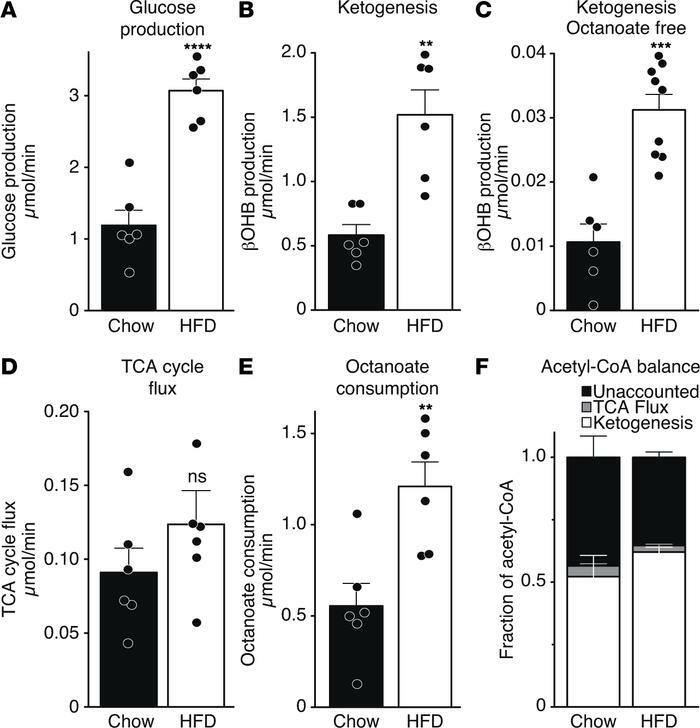 Increased hepatic oxidative fluxes provoked by sustained high-fat diet feeding in wild-type mice. (A) Glucose production and (B) βOHB production by livers of age-matched mice fed standard chow versus 60% kcal fat diet for 35 weeks, quantified by 1H-NMR of hepatic venous effluent from 60-minute portal vein perfusion using an oxygenated buffer containing 0.2 mM unlabeled sodium octanoate as exogenous fat, 3% 2H2O, and 0.2 mM sodium [U-13C]propionate. (C) βOHB production rates in separate perfusions using an oxygenated buffer that was otherwise identical but lacked an exogenous fat source. (D) TCA cycle flux rates, quantified by 13C-NMR of monoacetone [13C/2H]glucose derivatized from hepatic venous effluent 13C/2H–labeled glucose, from perfusions using an oxygenated buffer containing 0.2 mM unlabeled sodium octanoate, 3% 2H2O, and 0.2 mM sodium [U-13C]propionate. (E) Octanoate consumption rates by livers of mice described and analyzed as in A and B. (F) Imputed balances of octanoate-derived acetyl-CoA fates, based on octanoate consumption and measured disposal of acetyl-CoA through the TCA cycle and βOHB production. Note that little octanoate is esterified to glycerol, and much of the unaccounted fraction is attributable to AcAc. HFD, high-fat diet. n = 6/group. **P < 0.01; ***P < 0.001; ****P < 0.0001. ns, not significant by Student’s t test.